Lady’s Mantle – what’s in a name? 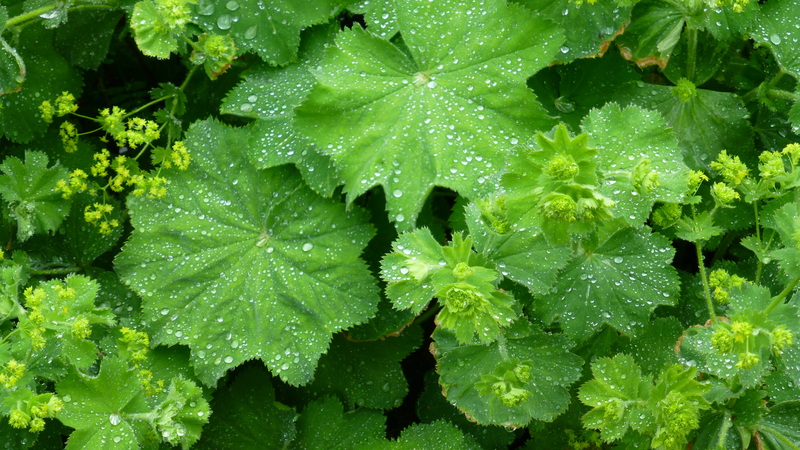 Lady’s Mantle (alchemilla mollis) has always intrigued me – not so much the plant itself, but its name. So when it started cropping up in the allotment and also in my boyfriend’s garden this summer in significant quantities I took it as a sign that I should do a bit of research to find out where it originates from. Interestingly, it seems that the genus ‘alchemilla’ in the plant’s latin name comes from the word ‘alchemist’ – an early day chemist/magician. The alchemists believed that the early morning dew which collects on the leaves of the lady’s mantle had magical powers that could help them find the philosopher’s stone (which, if anyone has read The Alchemist, will know that this stone would turn metal into gold). Very interesting! The plant’s common name – lady’s mantle – is thought to stem from the plant’s characteristically beautifully-shaped leaves, which look like a lady’s cloak. While many herbalists still use this plant for a variety of remedies, including the treatment of nausea, it’s more often found in gardens throughout Europe. It’s a tough little plant which will tolerate most soils as long as its not too dry – it will thrive in sun or partial shade and enjoys flower borders and beds. Lady’s Mantle is an early flowerer (June usually) so once the flowers have come and gone, you can prune from late summer onwards. All in all I think its an understated plant and one that deserves recognition for its seemingly vast and endless list of qualities (it’s also not susceptible to pests or diseases, which is a real bonus!). Propegate from seed in early spring/summer for planting out in the summer months.